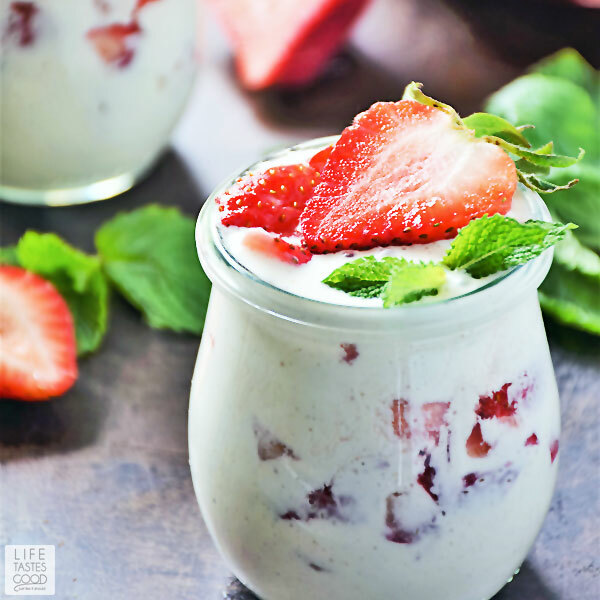 Fresas con Crema, also known as strawberries and cream, is a light, refreshing Mexican dessert with just 4 ingredients and takes mere minutes to prepare. This is quite possibly the easiest dessert you will ever make! What is Fresas con Crema? Fresas con Crema is a very popular dessert in Mexico. You will even find fresas con crema available at roadside stands when you have a craving for a sweet treat. It's so light and refreshing! I think it's the perfect ending to just about any meal. Fresas con Crema looks fancy enough to serve to guests too. They'll never know how easy it was to prepare! Translated to English, fresas con crema means strawberries with cream. Strawberries and cream is also a popular dessert in England. As a matter-of-fact, strawberries and cream is a traditional food served at Wimbledon. 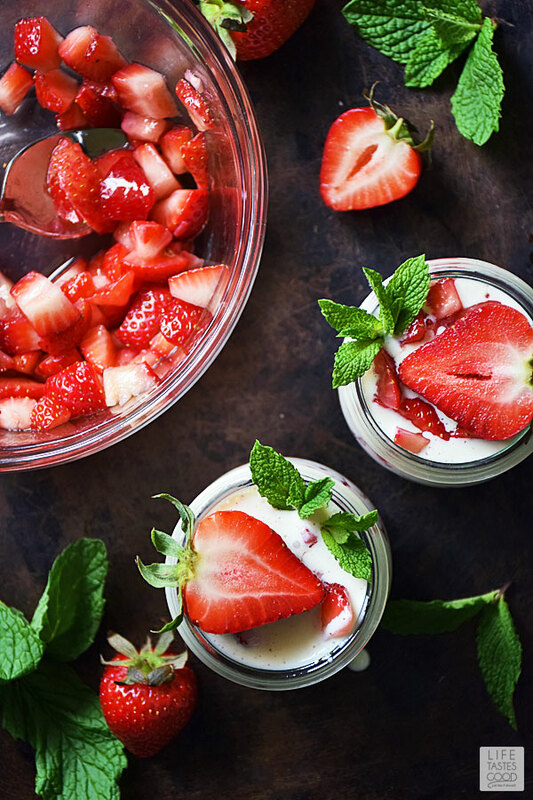 At Wimbledon, cold cream is poured directly over the freshly picked strawberries and served as a dessert. It really couldn't be easier, but I chose to make it more like the fresas con crema dessert you would find in Mexico by sweetening it up a bit with sugar and cinnamon. The cinnamon is a real treat in this dessert! Mexican crema is very similar to creme fraiche or sour cream. 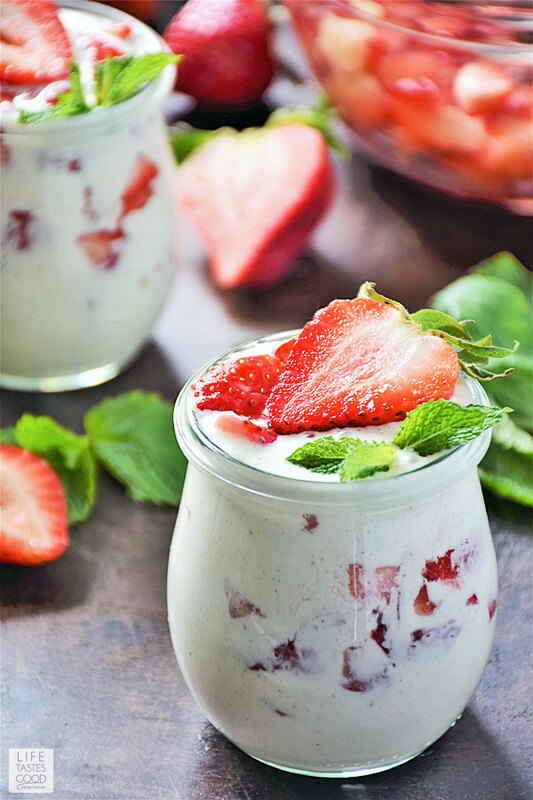 It has a rich and creamy taste that pairs nicely with strawberries. Can I Substitute Sour Cream for Mexican Crema? Mexican crema is not quite as sour tasting as sour cream, so I wouldn't use sour cream as a substitute for Mexican crema in this dessert recipe. Creme fraiche or even heavy whipping cream would be a better substitute if you can't find Mexican crema. You can, however, use Mexican crema as a substitute for sour cream to drizzle over your favorite Mexican inspired recipes like my Easy Taco Pie, Stuffed Butternut Squash, Taco Rice Bowl, or my One Pot Taco Pasta Skillet just to name a few. Mexican crema will give you a more authentic experience when enjoying your favorite Mexican inspired dishes. Look for Mexican crema, also known as crema Mexicana, in your local grocery store near the cheese where you will find other Mexican cheeses such as queso fresco. My store carries Cacique Mexican Crema, so that is the brand I use. How Do You Make Fresas con Crema (Strawberries and Cream)? 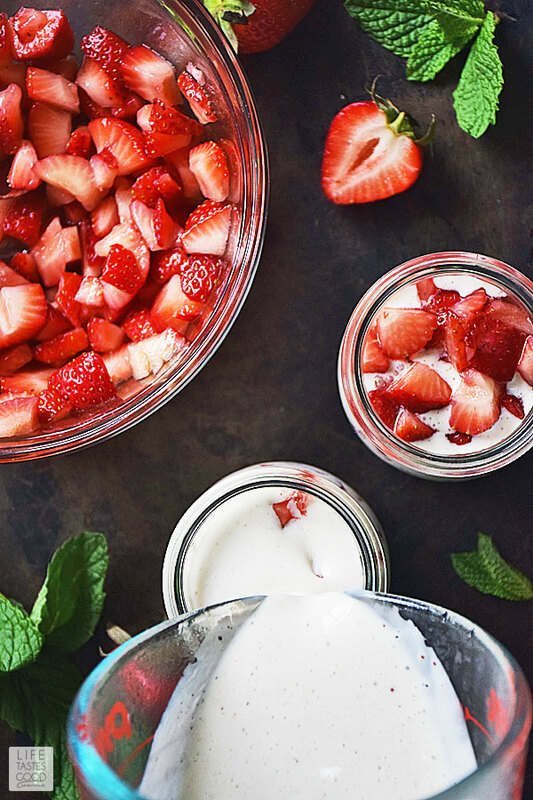 Fresas con Crema is quite possibly the easiest dessert recipe you will ever make. It certainly is one of the prettiest, don't you think? 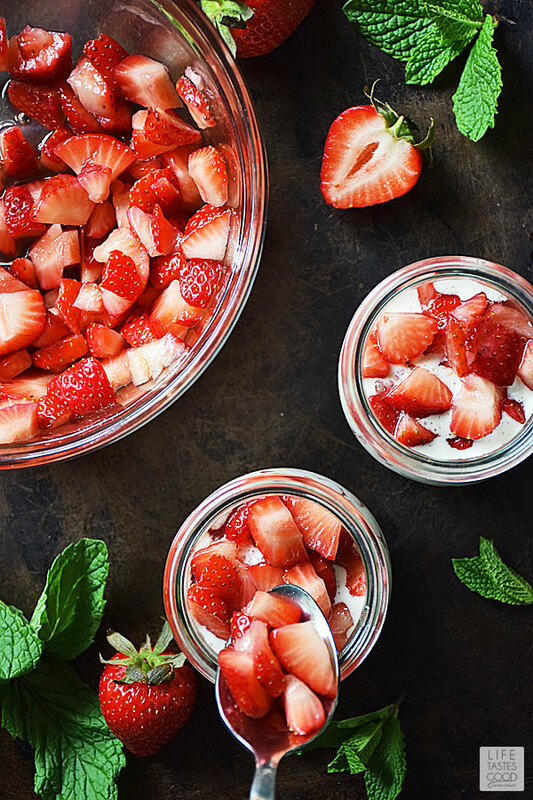 Strawberries and dessert go together like peas and carrots. I love using strawberries in desserts like I did with these super easy Strawberry S'mores Tartlets. Strawberries bring a fresh flavor to my Strawberry Jelly Roll Cake and for a sweet and tangy treat, strawberries dipped in balsamic glaze makes a wonderful snack. To make this Mexican inspired strawberries and cream dessert, dice a pound of strawberries. I like them diced about the size you see in the picture below. If the strawberries are too large it can be cumbersome to eat, in my opinion, but I can be lazy like that. 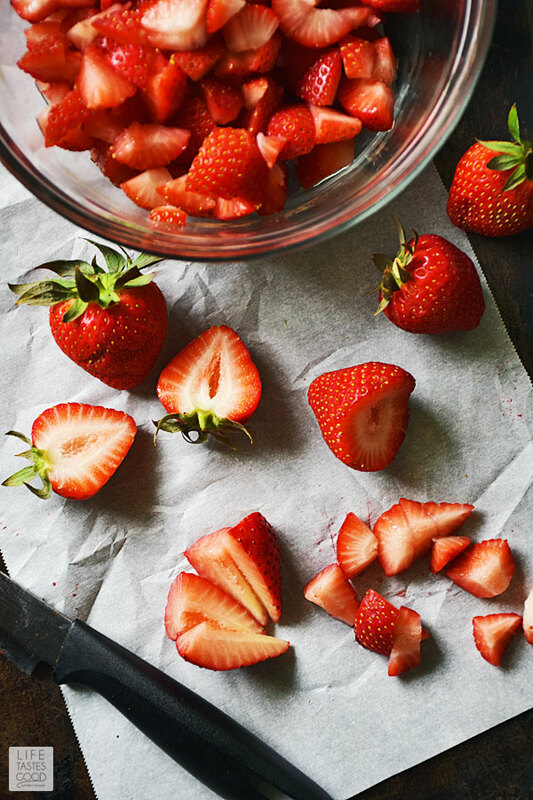 Tip: Reserve 2-3 strawberries to slice in half for a pretty garnish when ready to serve the fresas con crema. 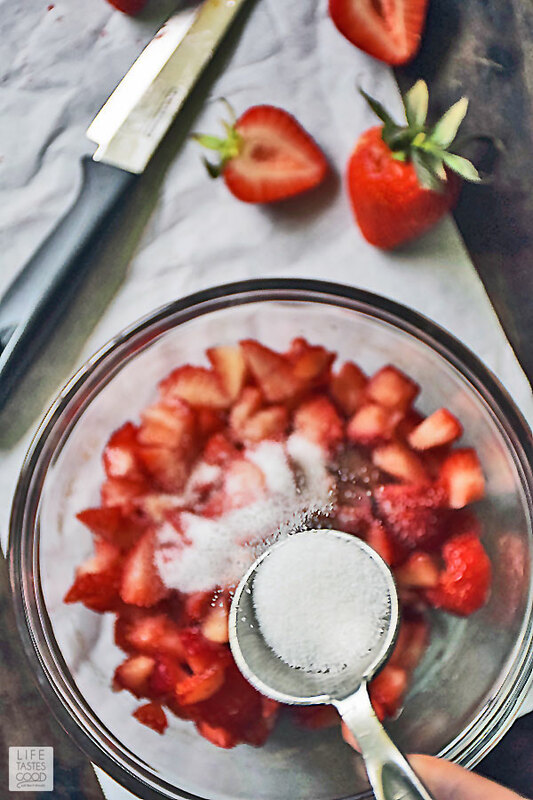 Sprinkle a tablespoon of sugar on the strawberries to sweeten as needed. 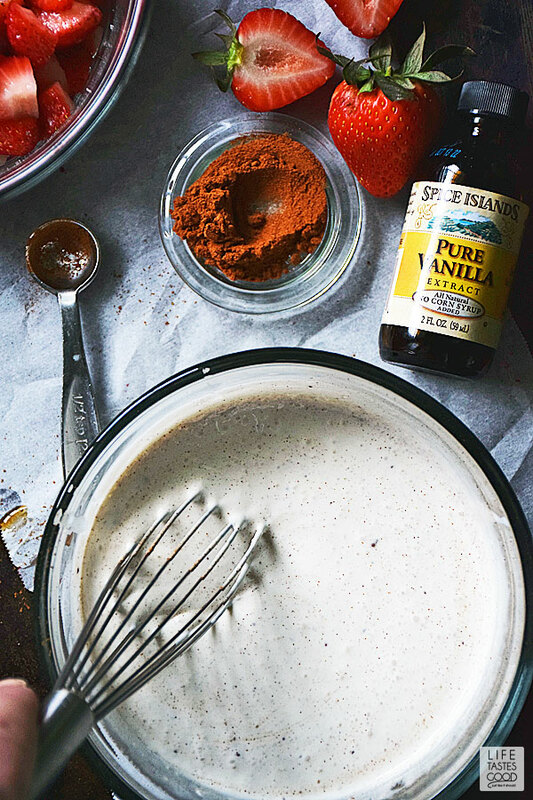 Set aside the strawberries while you whip up the sweetened crema. To make the sweetened cream for the fresas con crema, simply combine 1 cup Mexican crema with 1/4 cup sugar and 1/4 teaspoon ground cinnamon. Whisk that until well mixed and not grainy. If you don't feel like whisking by hand, a mixer with the whisk attachment will make quick work of combining the ingredients. Give this a taste and add a very small pinch of salt to bring out the sweetness. Give it another taste and add more salt if needed. If you aren't really keen on the creamy, milky taste you might find adding a teaspoon of vanilla will add that extra layer of flavor you are looking for in this dessert. Be certain to whisk until well combined. The crema mixture should be white with tiny flecks of cinnamon as you see pictured below. Divide half of the sweetened Mexican crema mixture into 4 serving dishes (Click here to get the Weck jelly jars I use for this dessert). Add about 1/8th of the diced strawberries to each serving dish. Evenly pour the remaining crema into each serving dish. If you are serving immediately, add more diced strawberries on top and garnish with a strawberry sliced in half and some fresh mint leaves if you like. To serve later in the day, cover each dish with lid or plastic wrap and store in the refrigerator until ready to enjoy. Just before serving add more diced strawberries and garnish with a strawberry sliced in half and some fresh mint leaves. If you made this recipe, let's chat! I'd love to hear what you think. Did you think the fresas con crema was easy to make? How did you like the addition of cinnamon to the crema mixture? Would you serve this easy dessert recipe to guests? What, if any, changes did you make to the recipe? Add the diced strawberries to a medium bowl. Sprinkle a tablespoon of sugar on the strawberries to sweeten as needed. Set aside while you whip up the sweetened crema. 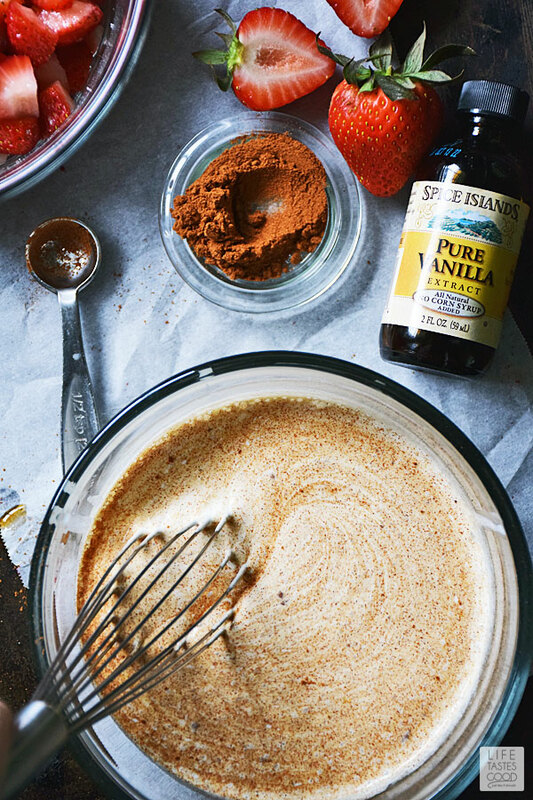 In a separate bowl, combine 1 cup Mexican crema with 1/4 cup sugar and 1/4 teaspoon ground cinnamon. Whisk until well mixed and not grainy (see note #1) Give the crema mixture a taste and add a very small pinch of salt to bring out the sweetness. Give it another taste and add more salt if needed. Add a teaspoon of vanilla if desired. To assemble the fresas con crema, divide half of the sweetened Mexican crema mixture among 4 serving dishes (6 ounces is ideal). Add about 1/8th of the diced strawberries. Evenly pour the remaining crema into each serving dish. If you are serving immediately, add more diced strawberries on top and garnish with a strawberry sliced in half and some fresh mint leaves if you like. Enjoy! To serve later in the day, cover each dish with lid or plastic wrap and store in the refrigerator until ready to enjoy. Just before serving, add more diced strawberries and garnish with a strawberry sliced in half and some fresh mint leaves to each serving dish. Serve & Enjoy! #1 - If you don't feel like whisking by hand, a mixer with the whisk attachment will make quick work of combining the ingredients.